Extremely Huge Lot NOS Wisconsin Engine Parts Various Engine Models & Model Yrs. 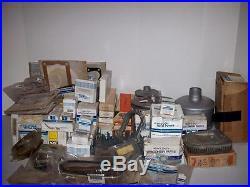 Huge Lot of Wisconsin Parts. These were from a store sellout. These parts weigh a combined total of approximately 90 lbs before boxing them up. 1-DB 186 C S30 piston. 1-DB 208SP piston & Pin. 1-DB 210-3SP piston & pin. 1- Piston (no part #). 3 AE 104 Ex Valve. 1-(no Part #) Ex Valve. 1-DA 83A S1 Connecting Rod. 2-DA 83A S10 Connecting Rod. 1-(No Part #) Pulley. 1-YQ5 Points & condenser kit. 1-YQ28 Distributor Cap & Rotor Kit. 1-Sync Ro # 21160 Stator. 1-(no part #) Valve Lifter. From a Smoke Free & Pet Free Home. I try to answer as soon as possible. Check out my other auctions for more great bargains on Unique, Collectible, Antique & Hard to Find Items! THERE ARE TIMES WHEN DEPENDING ON THE FRAGILITY OF THE ITEM THAT I MAY REQUIRE PROFESSIONAL PACKAGING. ALL SALES ARE FINAL UNLESS ITEM IS MISREPRESENTED........ I SELL VINTAGE, UNIQUE AND COLLECTIBLE ITEMS. ANY FLAWS OR CONDITIONS WILL EITHER BE NOTED OR PICS TAKEN OF THE HELP BUYERS TO UNDERSTAND EXACTLY WHAT THEY ARE PURCHASING. The item "Extremely Huge Lot NOS Wisconsin Engine Parts Various Engine Models & Model Yrs" is in sale since Sunday, May 31, 2015. This item is in the category "Business & Industrial\Heavy Equipment Parts & Accs\Construction Equip Parts". The seller is "eve1365" and is located in Hohenwald, Tennessee. This item can't be shipped, the buyer must pick up the item.